The FBI has launched a new investigation into whether or not the Clinton Foundation engaged in pay-to-play activity during Hillary Clinton’s tenure as Secretary of State. The U.S. Justice Department initially launched the new inquiry, which has reportedly been taken over by the FBI in Little Rock, Arkansas. Law enforcement officials and a witness who was interviewed by the FBI spoke exclusively to The Hill, which first broke the story Thursday. The investigation seeks to determine whether or not Hillary Clinton performed political favors as Secretary of State in exchange for financial generosity toward the Clinton Foundation – with the expectation of receiving such a favor. The investigation is also looking into whether or not the Clinton Foundation was compliant with any tax laws that apply to it during Hillary Clinton’s tenure, and whether anything that might be tax-exempt was taken advantage of and used for personal or political reasons, law enforcement officials told The Hill. The Little Rock FBI office did not comment to The Hill and deferred questions to the Washington, D.C., office, which declined to comment, The Hill reported. Clinton Foundation spokesman Craig Minassian said the Foundation would not “waver” in its mission in light of the new investigation. 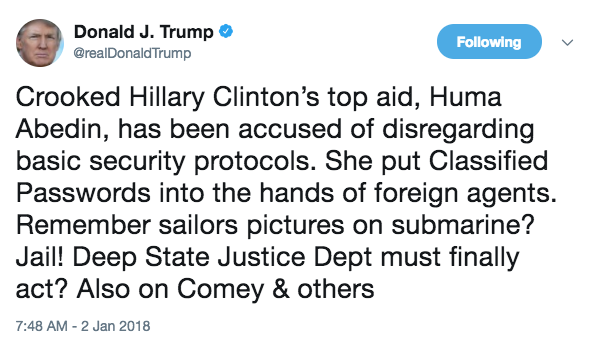 President Trump has persistently called out “crooked” Hillary Clinton on Twitter for not having been tried and sentenced to jail time over her actions as Secretary of State. In a December tweet, Trump even questioned why the former FBI deputy director’s wife received money for her campaign while running for the Virginia state senate. 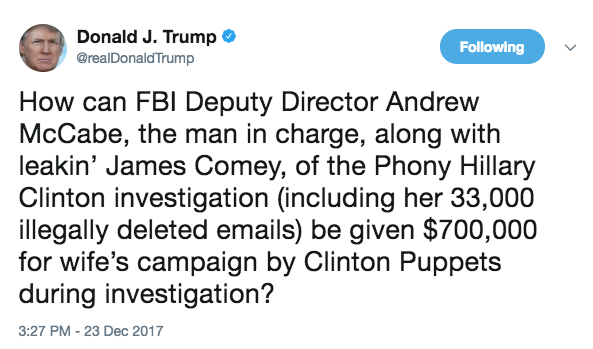 “How can FBI Deputy Director Andrew McCabe, the man in charge, along with [former FBI Director] leakin’ James Comey, of the Phony Hillary Clinton investigation (including her 33,000 illegally deleted emails) be given $700,000 for wife’s campaign by Clinton Puppets during investigation,” Trump asked in a Dec. 23 tweet from last year. And most recently, Trump tweeted about Huma Abedin, a longtime top Clinton aide, who is currently under fire for releasing classified information and breaching national security protocols. Huma Abedin forwarded State Department emails – including at least four classified emails – to her personal email account and her husband’s email account, for him to print out. Trump said Abedin should face “jail,” and he also called on the “deep state” Justice Department to act. “Crooked Hillary Clinton’s top aid, Huma Abedin, has been accused of disregarding basic security protocols. She put Classified Passwords into the hands of foreign agents. Remember sailors pictures on submarine? Jail! Deep State Justice Dept. must finally act? Also on Comey & others,” Trump tweeted on Tuesday morning. Hillary Clinton has come under fire in the past for her use of a personal email serve to handle classified national matters. She is also being scrutinized for the more recent news that two uranium deals that were reportedly pushed through under the Obama Administration under pressure and bribes from Russia – all while Hillary Clinton was Secretary of State, and that implicate the Clinton Foundation in the uranium bribery scandal, where the Foundation accepted millions.